UPDATED January 30, 2017 — The kids were found on January 24, and are home safe with their Dad. Thank you to everyone who shared info and to all who were looking for these kids! 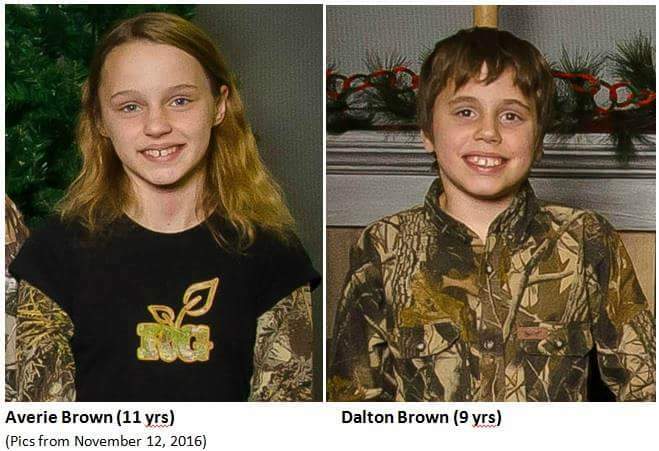 Please forgive me for a post that is not fiber-related, but I have a favor to ask: Two children from my community — Averie and Dalton Brown– are missing. We hope someone somewhere will see the posters and recognize Averie and Dalton and help bring them home. In grade school, my go-to items for show-and-tell were a perfume vial of my mother’s and a bonnet my dad brought back from Scotland when he was in the Army. This weekend, I’m taking something very different to Sievers for show-and-tell at the at the Gathering, which includes a new category this year — “Made for Charity or Community.” I’ll post pictures next week of the things other people bring. For now, though, I’ll tell you about the windsock sample I’m taking. Trust me, it doesn’t look this good, and this one is nothing to brag about construction-wise. I’m having trouble with thread tension on this slippery nylon, and in the future I’ll alter the assembly process suggested by the plans I found online. 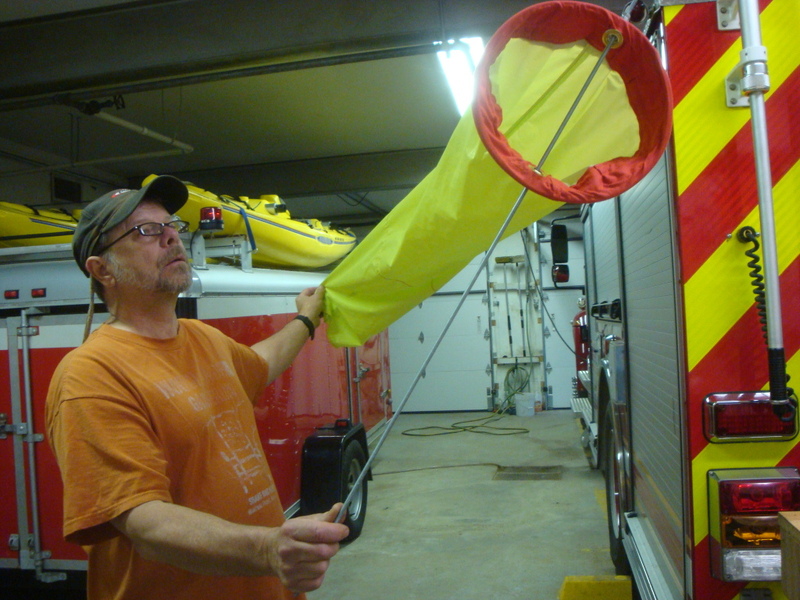 But the ugly sample I’m taking helped get our local volunteer fire department closer to a decent windsock to loft when setting up a landing zone for a medical helicopter. 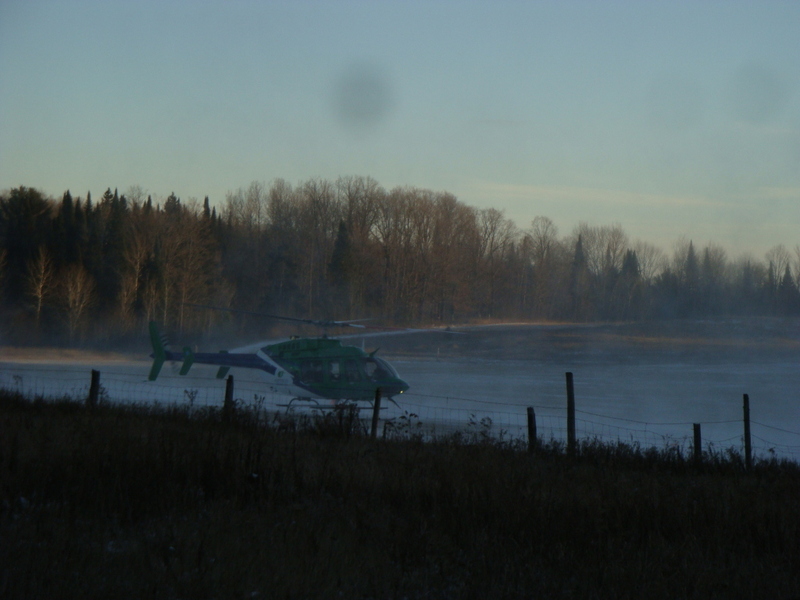 There’s a helipad at the hospital in Antigo. But that can be a long way, especially for the volunteer ambulance crews to our east. 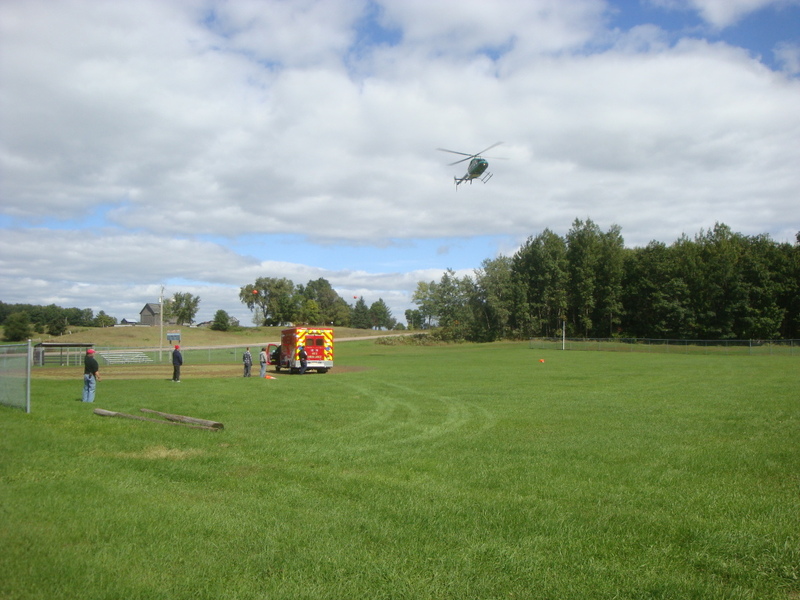 The ball field in Langlade is a convenient spot for for transferring a critical patient to a medical flight crew. So when the pager goes off, members of our volunteer fire department head there, set up cones and lights (if it’s dark), and communicate with the pilot by radio about features and conditions in the landing zone, which include power lines on the north side. For years, wind conditions have been measured by a piece of flagging tape tied to a post. A windsock would be much more visible from the air. So Firefighter Dave Worden soldered a copper tubing hoop, and I stitched up the fabric. 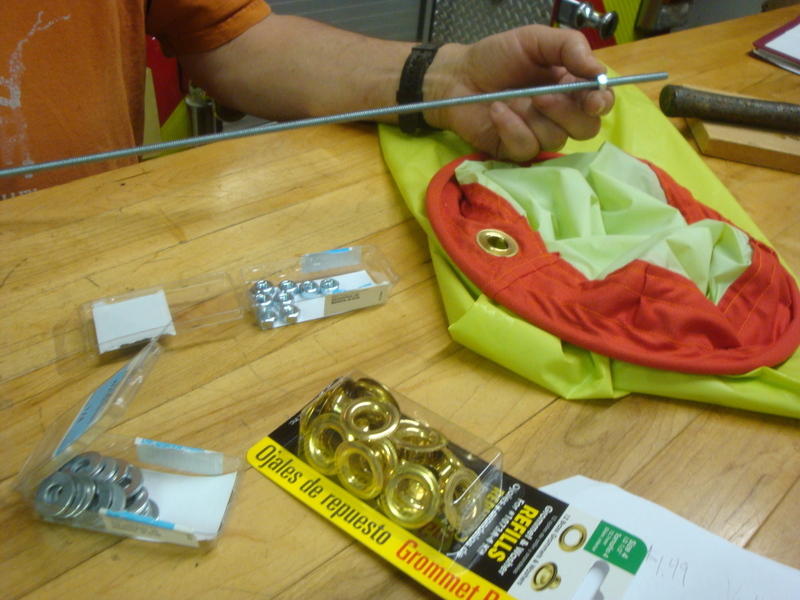 My husband Bill (the Assistant Chief) installed the grommets and assembled the windsock on a threaded rod. 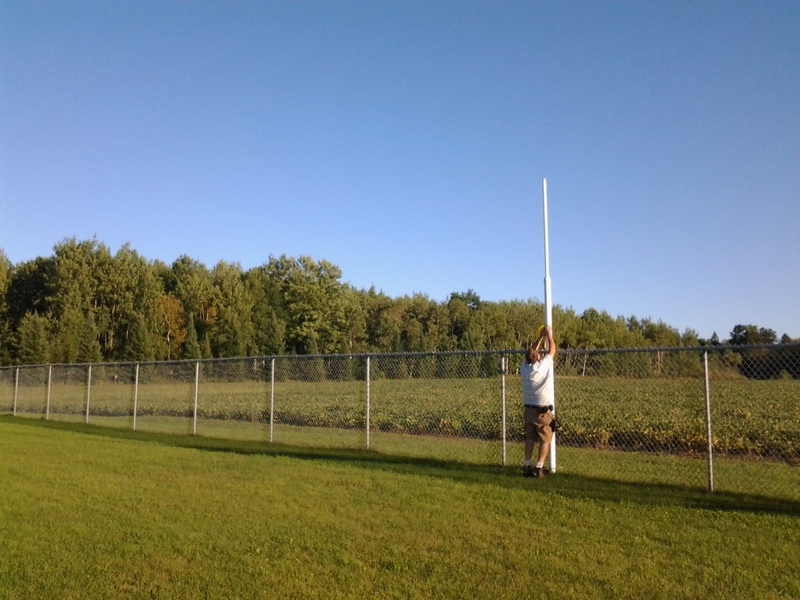 The rod can be zip-tied to a post or vehicle — not just at the ball diamond but in a field or wherever else they set up a landing zone. I should be embarrassed to let anyone see the sample I made from fabric I scrounged from a pair of nylon wind pants (too small) and a hoop I bent myself (also too small). 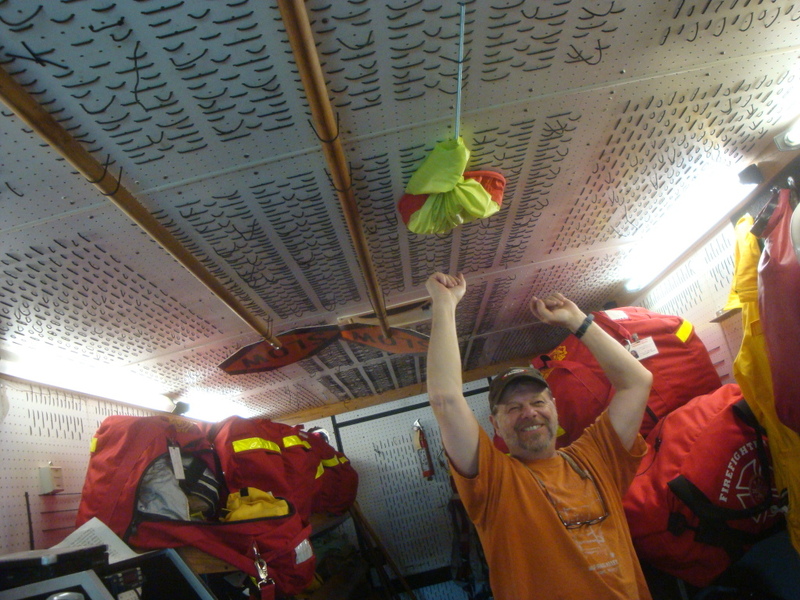 But our department’s windsock is stowed in the equipment van and it stays here. I hope they don’t need it while I’m gone, but they’ve been paged out to set up landing zones three times in the past month. Instead, I’ll take the ugly almost-full-sized sample I made, and be proud of what it represents — a caring community. If you’re heading to The Gathering this weekend, I can’t wait to see what you bring for show and tell. And you can be absolutely certain that your craftsmanship will shine in comparison! One of the pieces that’s always in my looping sample collection is this bromeliad fiber bag — one of the few items I didn’t make myself. It was a gift from my friend Jo Campbell-Amsler. She is much on my mind right now. I’m hoping the Smithsonian reopens for the Renwick Gallery’s scheduled Friday opening of the Cole-Ware collection of American baskets. The collection includes beautiful work from several of my friends. It’s an awesome accomplishment to have work in the Smithsonian, and I’m so proud of them! My looping sample case and class materials are packed and I’m off to lecture and teach this weekend at another museum — the Spurlock in Urbana, Illinois. But a bit of my heart is in Washington, D.C., celebrating for my friends — whether the Smithsonian is open or not. This beautiful video shows a few of the artists included in the collection. I’m inspired by my neighbor Marie. As far as I can see, she rises to any challenge with grace and good humor, but this one in particular strikes me as creative genius: You have a large but unknown number of cold, tired, hungry people and access only to what’s in your own larder. Could you work a loaves and fishes miracle? Marie does, with biscuits and gravy that are culinary works of art. This post is about creativity and community that’s probably familiar to many of you. And I hope you’ll share your own experiences in the comments section below. But to get my thoughts in order, here’s what led to the telling of this story about community. As you may know, I live in a rural area with a small population scattered over a large geographic area. It’s the type of place where firefighters and EMTs are all volunteers. My husband has served 25 years on a small department. Structure fires require assistance from neighboring departments. Last night, as the temperature slipped toward zero, Bill was paged out to a structure fire in a neighboring jurisdiction. On his way out the door he promised to assign himself a job that wouldn’t aggravate the back pain he’s had since Saturday. As he left, I was texting members of the our department auxiliary. Our newest member, Cindy, met me at the scene to pass out bottles of water, Gatorade and granola bars to firefighters. It was so cold, the Gatorade froze. At midnight, Marie and Jonita were serving biscuits and gravy, sandwiches, cookies and coffee to firefighters from a table in the house next door to the fire scene. None of us knew the owner who graciously opened her home. Many people from the community came together to take care of each other. One home was destroyed, but the people who lived there all got out. At this point, their story branches off, but my story about community continues — online. After leaving the fire scene last night, I went home and worked for a couple of hours. First, I posted Lesson 1 for students registered in the Cross-Knit Looping eCourse. The roster includes both first-timers and returning students from across the U.S. and in Europe who share a fiber interest. But you know how it is: You learn who the dog lovers are, what other interests students share, whose life is complicated by medical concerns, who’s planning an adventure. And you celebrate successes and discoveries together. In other words, it’s a community. Next, I posted a few pictures I took on the fire department’s Facebook page. Many people in the community have a limited understanding of what volunteers firefighters do. Much of what they do isn’t exciting and it’s virtually invisible: Two hours of repacking hoses, emptying creek water from the tanker and refilling it with clean water, going to town to get replacement parts for couplings that broke in the cold. Firefighters don’t do all that to get their pictures tagged on Facebook. But their spouses, cousins, neighbors and friends who are on Facebook are proud to share that those pictures with their friends (or Friends, in Facebook parlance). I see some of my neighbors more on Facebook than in real life. But you know what? I love that I can talk to someone I’m sitting next to about a picture of them I saw on Facebook. I love staying in touch with students who took fiber art workshops with me years ago. I love reconnecting with old friends from our canoe and kayak school days. I love keeping up with our godsons and a passel of kids who are interesting young adults now. And I love following the adventures of a group of women who became friends in a willow basketry class at Sievers lo, these many years ago. Those are the kind of friends who may not see each other for months or even years, then pick right up where we left off. That was true before Facebook. It’s true with Facebook. And I’m sure it will be true After Facebook. I suspect it will be true after we’re all just so much cosmic dust. Because what connects us isn’t digital. It’s the community we built. Together. What connects us is the community, not the carrier. It’s what we build together that makes a difference in our lives. P.S. I would love to hear your stories of creativity, community and connection. Hit the Comments link below and say your piece. Thanks! While I have certain avid interests, I haven’t really thought of myself as a “fan” since I took down my Bobby Sherman posters. But today you can picture me clutching the social media equivalent of an autograph book. Sievers now has a fan page on Facebook, and I am a fan. Sievers is a fiber arts school on Washington Island, just off the peninsula of Door County in Wisconsin. I first went to Sievers as a student back in 1994 (or 93?) 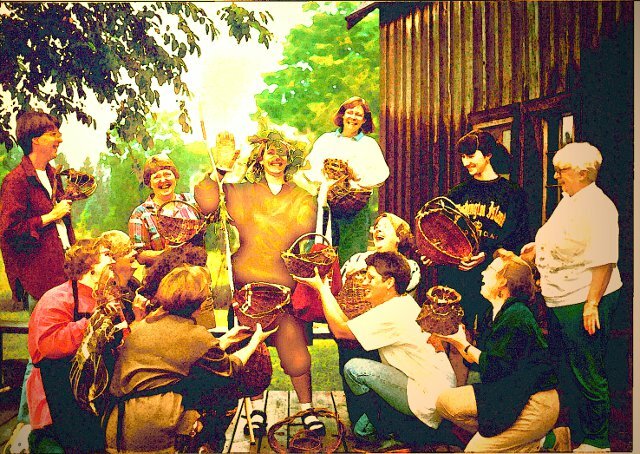 for a 5-day workshop in rib-style willow basketry with Jo Campbell-Amsler. The school been an important part of my life ever since. Are you a Sievers Achiever, too? Or maybe you have a similar relationship with another school, or a guild or art center. I hope so. There’s a synergy that kicks in when you work with other people in that type of environment. That kind of magic clings to you even after you all go your separate ways. So today I celebrate my return to Fandom. I raise my Sievers mug in a toast to all the people and places where creativity and community thrive. May we make it always be so. River Run Center for the Arts in McNaughton, Wisconsin, is now hosting a once-a-month open studio session, and last week I got to be part of the fun. It was great to spend time with my friend Rhonda and see some of her recent work, and lovely to meet some new people. Most were needle felting, and there was some good-natured 12-needle embellisher envy going on. My thanks to owner Joan Molloy Slack for the invitation! In rural areas like where I live and where River Run is located, it takes a bit of effort to create a community. It’s hard to pop into a shop or coffee house on the spur of the moment to join a group. Online groups are fabulous, but it’s very nice to get to know people who share your interests AND your time zone. So I’d love to hear: What fiber communities do you belong to, and how do you create them? Hit the Comment button and share your thoughts, or email donnastitches[at]gmail.com.